I am very fond of radio because television was introduced when I was a child. Radio was a major part of my life and (fwiw) I even went as far as becoming a hip-hop disk jockey on a San Francisco radio station, before I entered television. One form of music I love is called "Doo Wop". Two of my favorite groups are the Paragons and Jesters and (imo) their best album is called, "The Paragons Meet the Jesters". 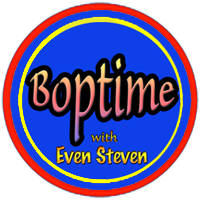 A few years ago, I was looking around the Internet and discovered a page titled, "Doo Wop and RnB Webcasts - Squire's Listing of Urban Vocal Group Internet Webcasts" [click to visit] where I saw a listing for "Even Steven's Boptime"; a Saturday morning show, "Boptime -- 6:00 to 10:00 A.M. [EAST COAST TIME] - Listen to Even Steven play music of the 40s, 50s, and 60s: bebop, hot bop, cool school, R&B, pop, rock 'n' roll" on University of Delaware's community radio station WVUD, 91.3 FM, and started listening. Having enjoyed "Boptime", I started listening to other shows on WVUD and was impressed with their quality programming. WVUD home page [click to visit] - program page [click to visit].